David Hope Crawford was born in Atlanta, Georgia. He moved to Wrightsville Beach, North Carolina, to start his musical career as a teenager, staying there till his mid twenties. David then discovered Edisto Beach, South Carolina, and now calls it home. As Edisto’s “favorite musical son,” David traveled to the Florida Keys to play on Marathon and Big Pine Keys during his thirties. 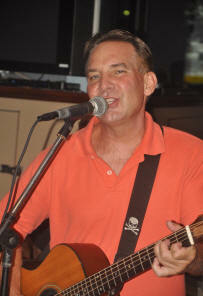 Now that he is “a pirate over 40” he plays mostly on Edisto, and in Charleston, South Carolina, and Augusta, Georgia. David’s musical influences include the following artists: Jimmy Buffett, James Taylor, The Beatles, Van Morrison, Bob Seger, Hootie, Johnny Cash, his many musician friends from the Florida Keys, and his duo partner from 40+ Pirates, Chris Tidestrom. Living on the East Coast most of his life, and usually only a few feet or miles from the beach inspired him to write about the “Crazy Going Ons” of coastal life. His CD “Dive in Theater” really sends that message home, as most of the tunes are about real people and real happenings. David writes many types of music, however “Trop Rock & Beach Music” are his favorites. In the past he has done a Country Music CD, as well as an Alternative CD. Listen to spots of David's originals below.